Did You Know? 95 Years At Knit-Rite! Did you know? Knit-Rite was established by Billy Isle, World War I veteran, an amputee and later a prosthetist. Billy was a Red Cross Captain during and after World War 1. He helped lead the establishment of prosthetic centers in London, Paris, and Rome for the veterans who had amputations from the war. He bought a knitting machine and put it on the front porch of his home. His wife Anna used it to knit the very first socks. Billy officially started Knit-Rite in 1923. They moved knitting machines into their prosthetic orthotic clinic building, and Anna started driving to other clinics to tell them about Knit-Rite socks. Later, Ted Smith became a certified orthotist, then a partner, and eventually the President of Knit-Rite. But the family business doesn’t stop there. Ted Smith’s son Bill started working at Knit-Rite when he was 14. Bill became the sole owner when Ted, and Billy’s daughter who was another partner, both retired. In 1976, Bill Smith’s son, Mark, started working at Knit-Rite when he was 14. Mark eventually became an orthotist and a certified prosthetist as well. He practiced prosthetics in another state, and eventually Bill sold Knit-Rite because he was ready to retire. Mark and his wife had a child and decided to come back to Kansas City. He rejoined Knit-Rite, working for the new owner for 15 years as Vice President of Technical Services. 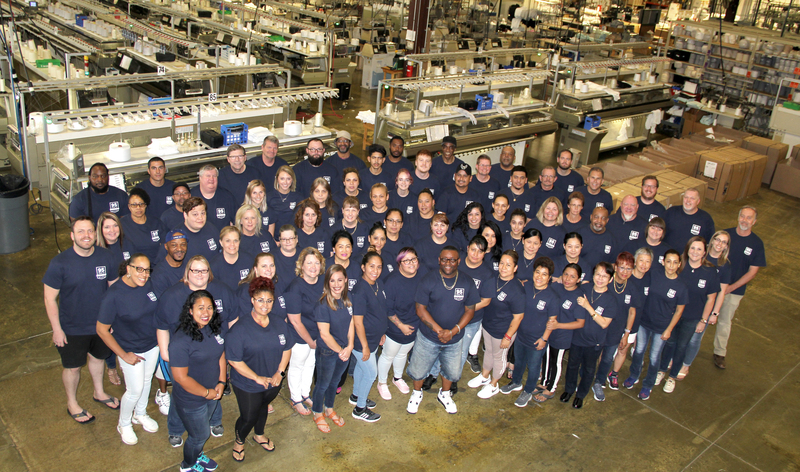 In 2006, Mark Smith, along with Chris Vering and Ron Hercules, re-acquired Knit-Rite, making it family owned once again, now for four generations of O&P practitioners! 3. Did you know? Knit-Rite started knitting prosthetic socks in 1923 using hand knitting machines called Lamb Knitting Machines. In the 1960s, Knit-Rite owned knitting Machines that ran off of punch cards. In the early 80s, they purchased knitting Machines from Switzerland, which ran off of small cassette tapes. And now today, Knit-Rite is using the latest knitting Machines with Flash Drives. The history of technology is right there! 4. Did you know? In addition to Knit-Rite originally being part of a large, regional orthotics and prosthetics practice, Knit-Rite was one of the main full-line distributors to the prosthetic and orthotic profession. And in addition to socks, they manufactured knee joints, wooden feet, wood knee shins and wood blocks for socket production. 5. Did you know? Knit-Rite has used yarns from various countries including Australian wool, Canadian wool, and US mill products. In 2017, Knit-Rite used 9.4 million miles of yarn. That is 20 round trips to the moon and back, and 376 times around the earth along the equator. That’s a lot of yarn, y’all! 6. Did you know? Just in 2017 alone, Knit-Rite used 205 tons of yarn. Each cone of yarn varies from 50 to 130 miles. 7. Did you know? Knit-Rite is the first company to produce a machine washable wool product line called Super Socks. 8. Did you know? We are more than just socks! Beyond the day-to-day knitting and manufacturing, Knit-Rite supports a neighborhood homeless shelter and food kitchen. They also house a Bible ministry and support many other charities. Boom! Hope you learned something new about my favorite company who is only 95 years young and going strong! Join us in celebrating with our customers who are more than just customers – they are family!